In our hour decorative ponds in the cottages ceased to be a curiosity and in some unprecedented and exotic event for the people. It’s a pity that many gardeners, organizing ponds on their plots, do not think that in addition to the aesthetic pleasure they can give more cash and profit. One method is the cultivation of carp in the pond at the cottage. The farming of carp in the pools of artificial origin simple and rather interesting case, which gives a good auxiliary income. Start to engage in this activity any vacationer who is not only lazy, even not having the skills and knowledge in this industry. How to breed fish in ponds in suburban areas, we present in our article. Carp are not picky about habitat and are well adapted for existence in small warmed and filled with poorly flowing water pools. In these ponds, fish expend less energy in search of food, because of this rapid gaining weight. The owner of the ponds is much easier to carry out care for their koi. However, in order that all good work should start with the preparation of the pool that is not very difficult to do. It is very important that the depth should be 1 – 1.5 meters, because of this, the water will warm up well in the sun. 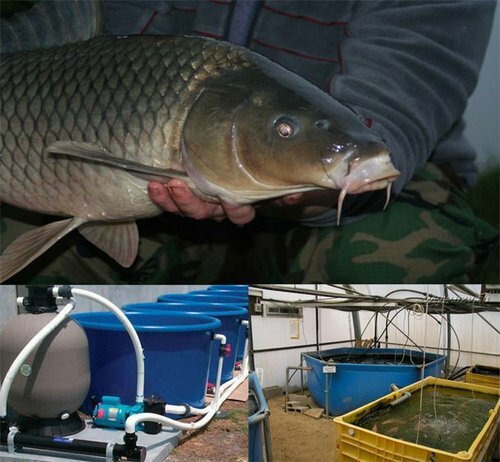 The favorable temperature for breeding carp from 24 to 26 degrees and not desirable, since fish stop eating and slow down in growth, and the increase which rapidly decreases the oxygen that can lead to suffocation. It is also necessary to take care of the property of water in the pond. If the source for filling the reservoir is a well, borehole or tubing, in this case, before you start fishing, you need to worry about the microflora of pools, in which fish will feel uncomfortable. The water needs to Mature for two to three days, so she warmed under sunlight and checked natural organisms, we can say was not decontaminated. To speed up such a process in a reservoir pour a couple of buckets of water brought up close to the natural pond and dipped a bunch of limp grass. pond make size from 9 to 10 cubic meters, with the intention that the fish had enough space for navigation. of course you need to install the system for water purification that will remove from the pond garden rubbish, chemicals and microorganisms, but also to saturate the water with oxygen. Here and without exception, the advice that you need to know for the construction of a fish pond. Carp have a good appetite due to rapid growth, they are not picky with food and are considered omnivores like pigs. They have a distinctive feature of the digestive system, no stomach, satisfied virtually continuously and regularly looking for food absolutely all over the lake, from the surface to the bottom. In natural waters to feed on mosquito larvae of different insects, dragonflies, midges, nymphs, tadpoles, slugs, moths, water and other various plants, etc. Of course, deciding to engage in the cultivation of carp in the country, you need to constantly keep in mind the fact that the fish need to be fed, in a set period of time. They do not require special and expensive food, it can be a meal of sunflower seeds, a variety of cereals, parboiled grains, insect larvae, earthworms. Based on the foregoing, the cultivation of carp in the country without any problems. Good food for cyprinid fish is poultry and pig feed, in this case, they need to feed the fish in advance and kneaded it in any capacity to the state of the dense test. 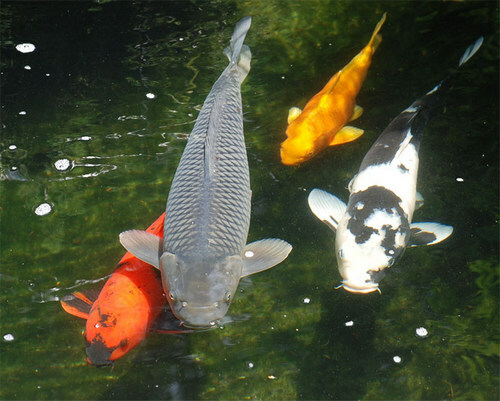 Carp need to feed one to two times a day, at the same time and in a certain place initially. In special farms for breeding of fish calling in some bells before feeding. In this way, carp fish produced conditional reflexes in the diet, they rapidly find food, easier to digest and grow faster. To all this, the food will turn sour in an artificial pond, if there is no flow of water, due to the fact that fish are to eat it. Focus on the water temperature, the lower it is, the carp eat less and of course poop will need not much time and will be noticeable as it will be required. In addition, small ponds feeding the carp fish should be done with help of table-tray has raised sides to make a bird feeder need coated with zinc metal. The following way will be easier to put it in the pond and get back. Furthermore it will be comfortable to keep track of how many fish consume the feed, because the remaining food is able to settle and spoil the biochemical and enterobacteriales the condition of the water in the pond. Country pond has difficulties in the breeding of carp fish. They are grown only in the summer time because in winter, the pond is covered with ice and the fish will not have enough oxygen for survival they can gibnut, for this reason, it is preferable to spring her not to leave. Once again to put carp in the summer the reservoir is allowed with the arrival of spring after the ice melts. To accelerate the melting of ice it is sprinkled with peat, coal dust or customary land. Because if you haven run into the pond, they will quickly gaining weight by the fall. Carp themselves are long-lived, living approximately twenty years. Very hardy type of fish, which perfectly adapts to extreme circumstances to survive. For the purpose of breeding should be left old individuals. If to breed in the summer pond carp fish, you will get a lot of pleasure from what you fishing far to go need not and will regale their guests with delicious fish soup from carp or barbecue. The advantage of such studies is the fact that the owners have fish ponds in suburban areas will be provided year-round meat fish.